What Is The Purpose of Doing Grounding? It is easy to get quite ungrounded, especially the way we live our lives today with little real connection to the earth. When you are working on your spiritual development, you may allow yourself to open via your higher chakras to the Divine realms. But once you finish you need to ensure you return to normal so you do not remain ungrounded. Know How To Make A Connection To Mother Gaia? Grounding will happen naturally but it can take some time, so taking action to make it occur more quickly can be helpful. It is sometimes actually necessary to be ungrounded when you are doing processes that elevate you to the higher realms. But afterwards it is also necessary to ground yourself, and make a connection to Mother Gaia. Energy grounding as a preventative measure to avoid health problems, is important. Make sure that you regularly ground yourself into the earth star chakra. If you are ungrounded, it is important to bring your self back to normal. There are a couple of grounding methods that usually work fairly quickly and work well. An easy way to start the process of spiritual grounding is by burning white sage or walk on the earth barefoot. If you continue to allow yourself to remain ungrounded, a variety of different problems, may develop. Do you know the symptoms of being ungrounded? If you are unsure, take a look at this list, to ensure that you know... Are you ungrounded? Often when you are ungrounded continuously, you may not be aware that you are ungrounded, but others around you may notice. If you are doing development of your gifts, especially psychic, spiritual grounding is important to do. 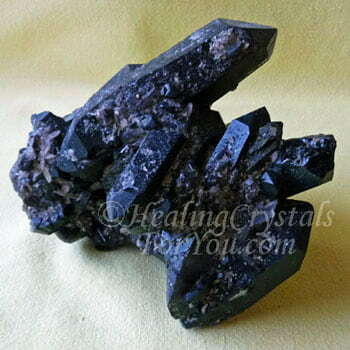 Holding a piece of Black Tourmaline in your hand will help to ground you. Unable to carry on a normal conversation, including losing track of what you were saying. Do you think that you are ungrounded? Do you know how to ground yourself? Do you think you need spiritual grounding? If any of these grounding questions came back with a 'yes', maybe you should think about taking action. Check out my list of frequently asked questions below, for more information. Some things you can do includes taking a walk on the earth, smudging yourself, doing a grounding meditation, and keeping one of the stones from the list on your body or close by. Some of the above symptoms are also symptoms of electromagnetic sensitivity, commonly just called electrical sensitivity. Check out the list of symptoms and see if your issues relate to electrical sensitivity, and see the list of EMF protection stones. Contact with the earth is very helpful, to assist you to begin to ground yourself and make a connection to the energy of the earth. At times when there is a lot of planetary activity or sunspot activity, grounding through earthing can help you. Of course if you are in a cold climate, and it is winter, walking on the earth may not be possible. An amazing and very helpful book that talks about earthing is the book Earthing, by Clinton Ober. If you are not in the position to be able to walk on the earth, there are now some excellent ways to achieve this by using a grounding mat, and this book discusses more about this. This book also talks about grounding bed sheets containing silver in them, and the benefits to using them. I sleep every night on a silver impregnated grounding sheet and I have found it very helpful to improve my sleep. Wisdom is about looking outward as much as looking inward, and looking forward as much as looking backward. Know how to do a grounding meditation? Its a simple and easy way to quickly ground yourself. 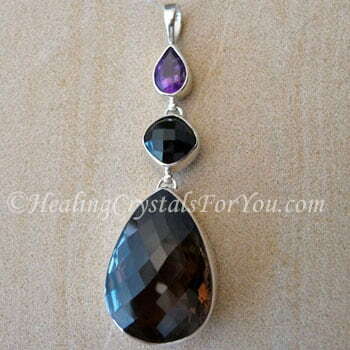 What are the best and strongest grounding stones? 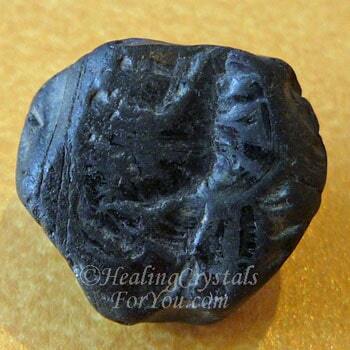 Check out the in-depth information about specific grounding stones. Did you know that there are a large number of crystals that will ground you. 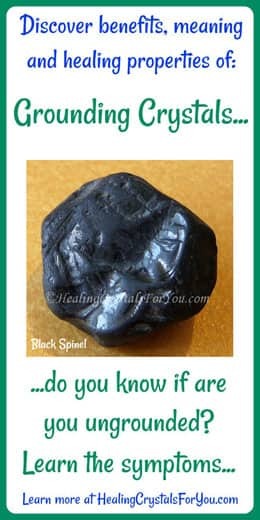 Maybe you already have some stones that you did not know could ground you? Also note that some people who think they are ungrounded may also be affected by EMFs. So read my article on Symptoms of Electrical Sensitivity and see the list of EMF Protection Crystals. Want To Find Out More About The Stones Mentioned? 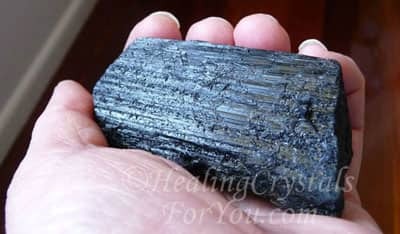 There are are quite a lot of healing crystals for you to use to help you, and they can be found on the list of grounding stones (mentioned above). Many of these stones have in-depth pages written about them. Its easy to learn more about any of the stones that are on the list! Are you ungrounded? Know the symptoms?